It's a big night for Big Brother. It's almost like the opposite of a double-eviction night, in that instead of two players walking out the door in one episode, one player was evicted and four had a chance to compete to come back in, which would leave the houseguest total even with the end of last week's live eviction. But did tonight's evicted houseguests win themselves a second chance? Or did Candice, Judd or Jessie earn that opportunity? The episode began with Aaryn complaining that "yet again, I have to appease Amanda." Aaryn's not clueless about this game. She knows how it's played. The Head of Household chooses the replacement nominee and no one else. If she were keeping it real (Candy-style!) she would've said outright that she wanted to put Amanda up but she knew she wouldn't have the votes to get Amanda out, so why agitate that semi-sleeping dragon for no good reason? Helen, on the other hand, had no choice but to campaign against Amanda to try to save herself. Because even though she's up against Spencer, she knows Amanda's influence is everywhere. And if she could wreck that, she had a chance. She even went as far as to work McCrae, talking about how Amanda doesn't treat him well. As McCrae noted, Helen's the same kind of pushy as Amanda. I'd describe Helen as more as relentless, and that's not such a bad thing in this game. But it does turn some people off, especially when her efforts turn to threats, which is what happened yesterday when Helen and Elissa tried to work Andy. I talked about this yesterday in my rant about Elissa. Helen took it too far and Elissa made it worse when she later tried to deny she was threatening Andy and eventually stormed out. The episode left that part off. Admittedly, Helen and Elissa's botched campaign efforts made the live feeds much more entertaining than they have been in a while, especially in the aftermath when everyone traded notes, as there were numerous conversations had between different sets of houseguests. By the end of all of it, it seemed obvious that not only did people want Helen out, but they want Elissa to go next. The live episode had Julie showing the Have Not competition to the houseguests, which led to some fun Houseguest Q&A. I love that GinaMarie managed to work Nick into her answer, even though the question and nothing to do with him. And note his hat, which she keeps near her constantly. Helen knew she was going tonight, and she looked gorgeous in her yellow eviction dress. But she still begged for votes during her final plea, and as a fan of people who are on this show to play the game (as opposed to get famous, have a showmance or whatever other motivations people have for being on Big Brother), I respect her for that. I didn't always love the way Helen played the game, but I loved her positive outlook on it from the start, and I loved that she campaigned and worked for votes pretty much to the last minute, which is more than can be said for other houseguests this season. But it was a done deal. Elissa was the only person to vote to evict Spencer. And I like that she did that. Voting to evict Helen wouldn't have earned her any favor with the rest of the house, and it shows her loyalty. Helen left the house after hugging everyone and telling them she loves them, which is one more demonstration of her positivity, even in defeat. And she was even more joyous when Julie told her she was going to get to compete for another chance to play the game. We got to see the Jury house, and watch Judd, Jesse and Candice learn that they might get to go back into the house, after which they griped about Helen and Amanda, knowing full well that those two women played key roles in their downfalls and plotting to exact revenge and exercise the "demons" inside the BB house. I hope they start with Clownie. What surprised me was that the four jurors were let back into the house tonight. They all hugged and squealed, but people were saying stuff to each other. Any one of the jurors could have spread information they'd acquired at the jury house to people still in the game, which could compromise players games. Meaning, let's say Candice shared some secret about Elissa with Judd, thinking it did't matter anymore because they're both out of the game, and that information would presumably not be heard by anyone actually still in the game. Judd could have then relayed that information back to the houseguests during the hug-fest. Granted, if Judd made it back in, he could do that anyway. But if he didn't, those secrets should've stayed out of the house. So I'm not down with the way they did that. Jury may be sequestered, but it's a different setting. The only person who should have been eligible to bring information back into the house should have been the winner of the four jurors. But maybe I'm overreacting. But I did see Judd saying something to someone during a hug, which is what caught my attention and made me wonder why they'd let them all back in like that. On the amusing side, I loved how not-happy everyone in the house looked when Julie announced the twist, except for Elissa. Because she's friends with everyone in the jury, including Helen, and has nothing to fear from them. And then I loved how everyone cheered and hugged and acted thrilled to see the four jurors when they came back into the house. Let's all pretend we didn't evict you and we're really happy to have to try to evict you all over again! Combining the jury competition with the Head of Household competition was a genius move, as the stakes are high on both sides of the board. The houseguests were set up on perches against a wall. The perch moved and balls flew at them. The houseguests have to catch ten balls and stay on on their perch while doing it. First to succeed wins HoH, and the first to do it among the jurors gets to stay in the house. Of course, if a juror is the first to do it, not only do they get to stay in the house, but they're also Head of Household. The episode ended before we knew who won. We'll post updates once the feeds come back on! LIVE FEED SPOILERS AHEAD! 10:26 p.m. EST - Spencer and McCrae are down. Jessie has 4 balls, I think. Judd has 2. Helen has 1. Candice has 2. Can't see any of the balls on the Houseguest side. Update, looks like Elissa has 5, Amanda has 4, GinaMare has 2 and Andy just fell. 10:31 p.m. EST - Feeds just went to trivia again. Hopefully they'll come back on soon. In the meantime, on the juror side, it looks like Jesse's in the lead and on the houseguest side, Elissa currently has the most balls. 10:37 p.m. - Feeds back and Jessie just fell. She's out and it sounds like she left the yard right away. Funny moment. After Jessie fell and then left the yard, Aaryn stood up and said "Jessie, you're out of the game." She repeated it again and then said another line. There was silence for a moment and then she asked someone "can you repeat the line for me?" So it looks like Aaryn will be "announcing" this competition for Sunday's episode. 10:40 p.m. - Judd's complaining that he can't hang on. Ball count, Candice has 2, Helen has 2, Judd has 3. GinaMarie has 3, Elissa has 5, Amanda has 3. 10:44 p.m. - Some guy just came out with a foam finger and a red wig screaming at the competitors that he's their biggest fan. He jumped around and made a lot of noise, and then a "security guard" showed up and ran him off. 10:48 p.m. - Ball count - Candice 2, Helen 3, Judd 4, GinaMarie 3, Elissa 5, Amanda 4 - Update, GinaMarie just got 1 more, so she has 4. 10:54 p.m. I swear GM had a fourth ball, but then the feeds cut and when they came back there were only 3 in her tube, so she has 3. All scores the same. 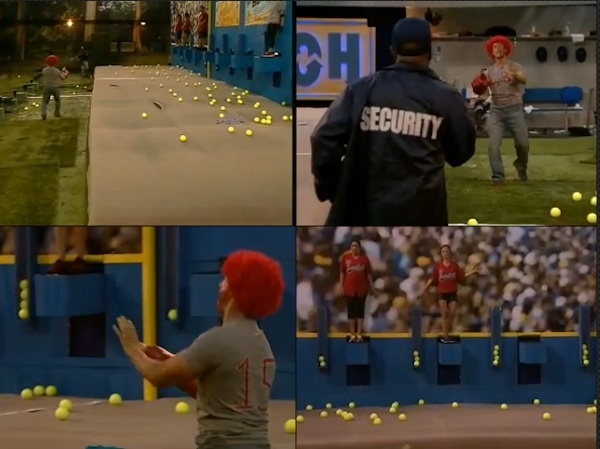 Ok, Aaryn just did an explanation announcement that GM's ball bounced before she caught it. "It does not count, it has been removed." 11:00 p.m. - Elissa has 6. I think everyone else's scores are the same, but the feeds cut so I'll update again once they're back. 11:05 p.m. - Candice 2, Helen 3, Judd 4, GinaMarie 3, Elissa 6, Amanda 4. Helen just fell. She's out and she's gone! Pretty sure Candice just fell too, which means Judd will come back into the house! He's still on the wall, which means he's still in the running for HoH too. Confirmed, Judd's the winning juror! Judd has said he wants to start a clean slate now that he's back in the house and that he's not mad at anyone. He also joked (kind of?) that he was happy they got Helen out. Assuming he knows it was her doing that got him sent packing. 11:14 p.m. - The crazy fan just came back. Elissa caught another ball. She's at 7. I think Judd's still at 4. GinaMarie has 3, Amanda has 4. Worth noting here that Elissa has been laser focused this whole game. She hasn't said a word. Just a note that I'm posting updates as they happen. If it's a few minutes since the last update, assume the scores are the same and nothing's happened. Or the feeds cut to trivia, which they did just a minute ago. Before the feeds cut, Judd was in the dugout filling in the guys on some jury house things. Stuff Jesse said. 11:31 - Elissa just got her tenth ball! I was just about to post that she got her ninth and that Amanda had 6, but then Elissa won another ball. Elissa is this week's Head of Household! There is no predicting what she's going to do as HoH. We know she doesn't like Aaryn and GinaMarie, but she also knows Amanda's running the game. She might put up the former two and try to backdoor Amanda. Or maybe she'll just aim for Aaryn or GM. Or she could form an alliance with someone and do something totally different. We'll find out soon! In the meantime, I'm glad to see Elissa win another comp so soon after this week's Veto.